"Mercy", a 10-day exhibition of mixed media and interactive art made its debut 29 August through 8 September 2005 at the Metropolitan Pavilion in New York City. 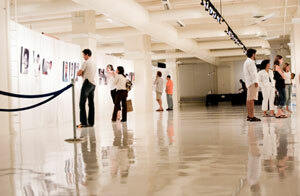 Mercy featured 108 photographs, six video installations and three soundscapes. Started with a $75,000 donation of gallery space fromt the Pavilion, Harrison and his team of volunteers secured more than $400,000 of gifts in kind from local businesses to make the show possible. Despite opening during the unforeseen destructiveness of Hurricane Katrina, the show received widespread support from the press, garnering more than 20 media items, and from exhibition attendees themselves, who contributed more than $95,000 in donations towards the work of Mercy Ships in developing nations.